Leopard jacket, thrifted. Blue shirt, thrifted. Turban, hattbaren. Bag, Miu Miu. Jeans, H&M. Sunnies, Karen Walker. WEDNESDAY. I was so excited when I found this leopard jacket at a local thrift store for $10 a couple of weeks ago. I have been waiting forever to wear it and today it was finally warm enough to take it out for a walk! That jacket is perfection, you lucky thing! i love these photos :) and the jacket is awesome. I love how you paired it with a boyish outfit–really nice contrast!! and are you wearing a turban?? I looove turbans! i like your photos, how do you make this with the white sunlight? and who does the photos make? your friends, by your selfe or a photographe?? love the turban!! ps. aren’t karen walker sunnies the best? You’re outside?? Say whaaa.. Oh and amazing jacket! beautiful photos! I loved the whole “vintage” look they have! love the coat, i’ve a leopard fur coat too, leopard look is back again this year! love your style, it’s similar to mine! wunderbara bilder. älskar solisarna! SÅ snygga!! Virkelig flot outfit! Frakken er virkelig lÃ¦kker! anna: I take some of the pictures myself, and sometimes my boyfriend takes them :) These pictures where taken with my iphone. hannah elizabeth: thanks! Yessss, I bought these ones last summer, still love them! you look STUNNING !!!! i Love this outfit A LOT !!!!!!!!! Lovely pictures, you look great! 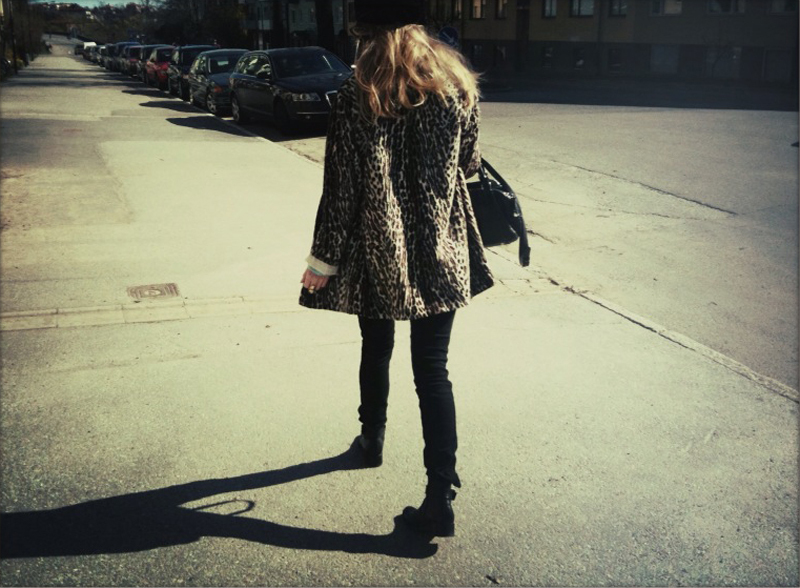 I really like that leopard jacket on you and it goes so well with the jeans shirt underneath – wonderful. Great pics, love the coat!!! I like so much your pictures! you look gorgeous, like always! Wow such a great deal!! It looks great on you! Like it a whole lot! 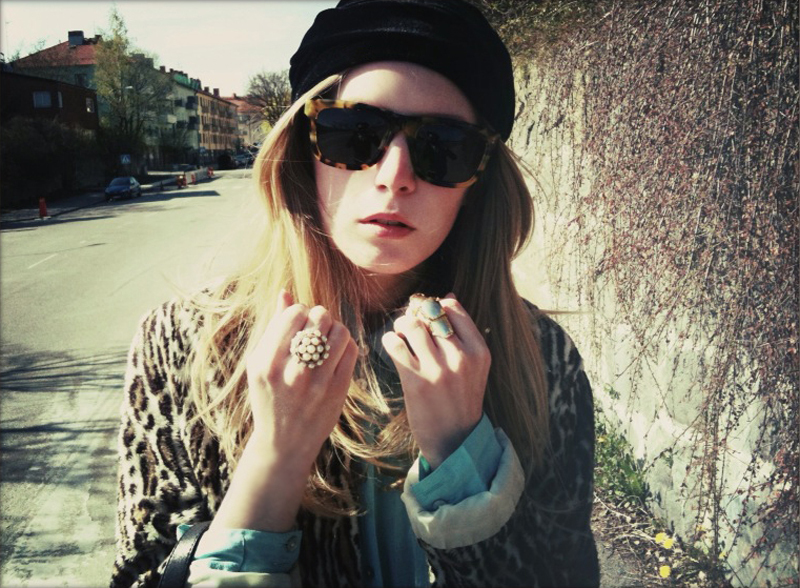 those glasses and that leopard jacket totally make it! great leopard, and i love the quality of these pics…. dreamy, like a film…. Love your shades, you look awesome! you look amazing, really really beautiful! ;) love the jacket and the hat/band! great!! You look fabulous!!! That jacket is amazing! I recently acquired some fur stoles and I am awaiting proper weather as well! this jacket reminds me so much of that one (i’m sure you’ve seen it) that Kate Moss used to where everywhere/all the time a few years ago. its gorgeous. I’m deeply in love with your leopard jacket and with the entire outfit. I really like when you wear rock clothesc and really original accessories. 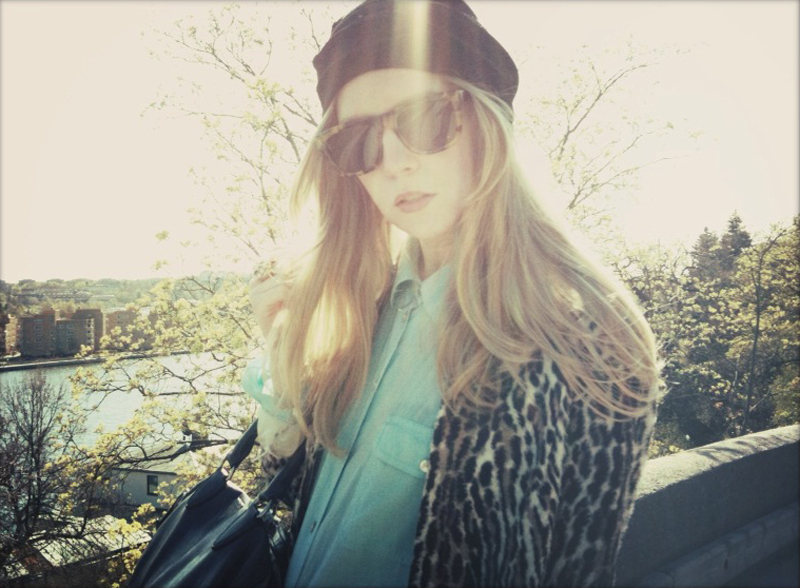 Nice pictures, love your outfit, love you blog. the pictures are amazing! did you use film? or is it just editing? beautiful photos! i love the white ring! your look is just amazing!! and your blog is sooo nice! OMG This is amazing!!! Love the outfit and the pictures are awesome! lovely photos, love the shades and sunlight!